I’ve been told that Starbucks partners will receive a copy of this book early. I think their copy arrives about two weeks before the national release on the 29th. I have already pre-ordered my copy of the book. I received an email about it from MyStarbucksRewards and was easily persuaded to buy a copy. I have noticed that blog badges and blog articles about onward are beginning to pop up here and there. I am still encouraging my readers that if you are going to buy this book (whether in Kindle format or hard copy) to use the widget in the right column of this website. It will be a small way that you can help StarbucksMelody.com running and alive. And as always, if you like this website, hope you’ll click the “like” button on the Facebook link also in the right column. 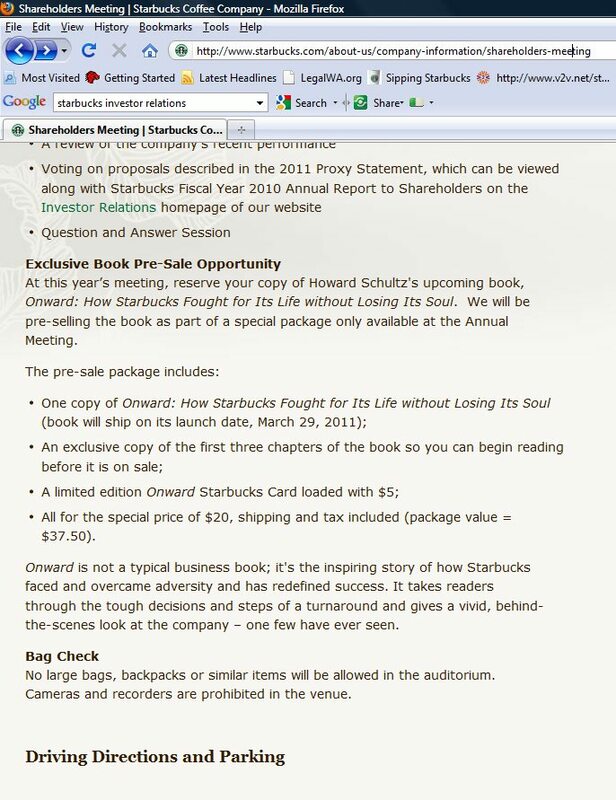 At this year’s annual Starbucks meeting, there will also be pre-sales of Onward happening. 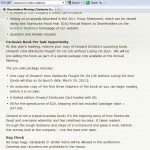 For those actually attending the 2011 Starbucks meeting in Seattle, there is a really special Onward offer that includes a pre-loaded Onward Starbucks card. I feel pretty sad that I might not be going to this. I don’t know why but I haven’t received my proxy to vote thingy in the mail. I called Charles Schwab but I have no idea what is going on. I think I am having mail problems. Anyway, I might miss the chance to be there in person because without that proxy, I cannot get inside! Back on the topic of the Onward offer at the annual meeting, for those attending the annual meeting they get a booklet of the first 3 chapters of Onward so that they can start reading early. Take it away in the comments! Sharing a random find: Have a Beautiful Day. Starbucks loses a partner in the Connecticut shootings. I’m very excited about this book and I can’t wait to get my partner copy of it. already ordered “Onward” thru your link. Looking forward, and hoping not to be disappointed! and, OMG, I hope you get your proxy in the mail. that would be a bummer! @BCav – You are welcome! @deniseR – I will be pretty bummed out if I don’t get to go. I wonder if there is any way I can get in the door without my proxy vote ticket, but I don’t see that there is. I have 2 addresses, one of which, I recently realized, has a small problem getting mail. The same address where I didn’t get a bunch of MyStarbucksRewards card is the address where the proxy vote is missing … I called Schwab and they seem to think I should have it. I like seeing so many familiar faces at the annual meeting. I guess Howard won’t get a question from me this year! can they fax you another???? (@melody) YOU need to be there! you’ve gotta know some people who can vouch for you? or soemthing??? My Schwab Starbucks Proxy Vote information was found in my junk email dated around Feb 5th. It seemed to indicate that you had to opt-in to receive a paper version. I voted for some of the directors, but not all. I look over our company’s profit sharing plan, and I can tell you out of 50 or so companies, very few send out paper annual reports and quarterly filings anymore…and I havent opted for electronic delivery with that account yet. Most fo the times it is just a white envelope from “Proxy Services” that directs you to a website. A great book about a great man…I hope this will be as good as his biography or even better. “Onward: How Starbucks Fought For Its Life Without Losing Its Soul “. Probably the book is released in Japan several months later. But the title of the book released in Japan may be changed, I do not know why. I hope to Japanese publishing company to do not change to title of the book. But I think they will change it. The cover has Japanese title, Japanese commercial message and Japanese explanation. They destroy the excellent design of this book. @Noboru – You are good! I knew that I had read that the proceeds were going to the CUP Fund! I guess there was a change of plans. I wonder why the proceeds are now going to the Foundation?? I am getting very amped for next Tuesday! I can’t wait to see all the changes, and write a blog post about the beautiful new merchandise and stuff in the stores. I am going to get up early to see everything. Maybe head into the Market! Here’s hoping you get your proxy soon! I get to do the promotional setup in my store on Monday night, very excited about the big changes for everyone to see. 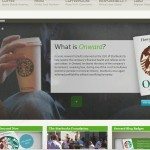 Onward will also be sold in the stores, and will include the $5 Starbucks Card mentioned in the Shareholder meeting information. The bundle will be the same price as the book’s list, so it’ll be like getting a $5 card for free. Sorry you only get the first three chapters at the meeting, I’ll be pouring over (get it?) the pages of my partner copy as soon as it’s in my hot little hands. @ChrisW – Yay! That’s great news! It means I can still get the card even if it really turns out that I can’t make it to the meeting! There’s a long background story, but I cleared some time out of my Tuesday schedule, so I probably will be visiting downtown Seattle, and writing about this launch as soon as I possibly can on Tuesday! I probably won’t be ordering the book, but I am curious to see how much Starbucks has changed (not just logo-wise). The new book sounds great and like the idea of where the proceeds are going. My local SB is starting to get ready for Tuesday. Can’t wait! They say however they are not replacing the logo because it costs too much. Can’t quite understand that? Isn’t corporate paying for it? People are starting to get excited! I will be definitely be ordering this book. I am really looking forward to visit Starbucks on Tuesday morning to see what the changes will look like. 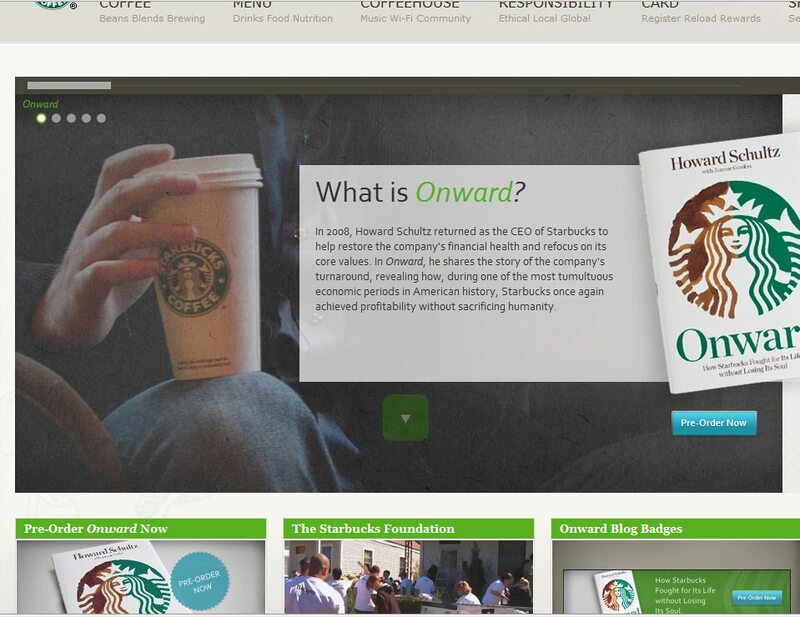 Hi Melody — just as a quick “official” point of order, the proceeds from “Onward” are being split between the Starbucks Foundation and the CUP Fund. Thanks for the great post and hope to see you on Tuesday! The book Onward: How Starbucks Fought For Its Life Without Losing Its Soul….. I read this and I can’t help but to think, “Is MSI fighting for it’s life and losing it’s soul?” Perhaps this a bit off topic, but when is Starbucks going to do something about MSI? I haven’t been paying much attention, but has anybody else tried the Tribute Blend yet? I think it’s pretty good…. @CoreyDu – Hi there! *waves hi* Thanks for the clarification – I didn’t realize that it was both the Cup Fund and the Foundation! Looking forward to all the good stuff coming and happening on Tuesday! @Chgo – MSI needs a lot more moderation. I’m reluctant to talk about it here because I think that some people at MSI there are avid blog readers here, even if they don’t join in. I don’t want to act like I’m talking behind someone’s back, if you know what I mean. MSI often has weekends where it falls apart because there are no mods online. It didn’t used to be that way. There used to be mods who would respond to my emails on Sat or Sun. There used to be more mods. It’s amazing though how just a few people can totally change the personality of a site. I’m convinced that when a site gets to a certain level of busy, it’s almost impossible to prevent unless there’s drastic stepped up moderation. I did say this was an open thread so I guess this is fine. If nothing else, MSI should recognize that there is a pattern of site deterioration over the weekend during non moderated hours. USA Today just put up an interview with Howard Schultz you might be interested in, along with a photo timeline. I was stunned to hear his biggest flop was Sorbetto. Dang it was delicious!!!!!!! I guess it was partly a HUGE flop because clearly they invested huge amounts of money into it. Sorbetto required special machines, and there were Sorbetto aprons and Sorbetto teas, and it required labor to clean the special machines. I loved his answer that “I know where Starbucks store is” – That was great! He probably does have like 16,000 locations memorized!! @chgo: I’m drinking Tribute at home now and really liking it MUCH more than I did the little ‘tastings’ over the past few days. Really enjoying it and also tasting more of the berry flvors than I did from the store……when I tasted mostly Sumatra. Liking it alot! re: msi. ughhhhhhhh. it is going downhill so fast due to a very few and, as Melody said, so little moderation. and, re the book “Onward…..” while I look fwd to it, I find that little string of words about ‘losing its soul’ (‘w/out losing its soul….) kind of….interesting. Because to me, they did lose alot of their soul. Maybe they’re about to try and revive it. I hope so. The USA Today article interviewing HS is interesting. Re MSI I do not go there as often as I used to because of all the reasons stated before. Shame that it has reached this point. Looking forward to tomorrow. I think that HS interview took place at Olive Way Starbucks fairly recently. Anyway, I could have easily believed that some of the movie ventures (Akeehlah and the Bee? ), or wasn’t there a movie that Sheryl Crow sang several soundtrack songs from?, or other big flops might have been Chantico, or Joe Magazine. I guess you gotta throw a lot of spaghetti at the wall to see what sticks. @ denise – I haven’t been a die hard for as long as Melody, yourself and countless others, but what I have seen happen over the past 8 yrs., it has definitely lost something if not it’s soul. This is what I am starting to not like about MSI! Wouldn’t so many of these ideas suggested change Starbucks very soul? Maybe it is good that the majority of the ideas are overlooked. More and more I see that sight as problem and less then an asset if you can call it that. If Starbucks soul is or ever was at stake, for every step it takes forward, it should take two steps back. It’s past is the key to it’s present and future. At least that’s what I believe. @chgo: I agree about its past = its future. or so I wish. Personally, I could never understand why an anniversary (as this 40th) is all about the ‘future’ and changing the logo etc. Seems to me an anniversary, by its very nature, is mostly about tradition, more than change. That’s more what they did back in ’96 with the 25th anniversary and all its hoopla….. back to the past. and msi, too bad. too bad. re: tomorrow (anniversary day), they were setting up, a bit, in my store this afternoon. there were quite a few very cool things…….